About one hundred Delft residents who are living in temporary structures whilst waiting for the government to provide them with RDP houses, blocked Symphony Way Road by burning tyres in a protest over their living conditions yesterday. This demonstration was the latest in a series of such protests in the area. Two weeks ago residents burnt tyres on the same road for the same reason. Fire fighters yesterday arrived to extinguish the burning tyres whilst police kept a watchful eye on residents in the area. The residents also accuse the Housing Development Agency (HDA) of illegally selling houses and say they need the security of knowing that RDP houses will definitely be built for them. Singing, marching and carrying placards while overturning rubbish bins the residents marched to the offices of the HDA to demand answers. 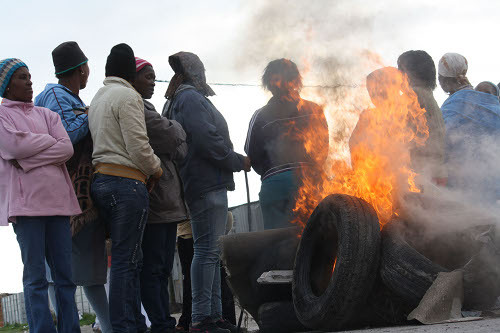 Masonwabe Gubu, 56, said they had been protesting since Monday and on Tuesday night during a community meeting the residents decided to burn tyres to show their anger towards the areas Subcouncil committee. He said residents living in the Temporary Relocation Area’s (TRAs) had had enough of staying there, claiming they were told they would live in the TRA temporarily but believe that the City of Cape Town and the provincial government have no plans to allocate RDP houses to them. He said the reason the community decided to burn tyres was because the HDA kept postponing scheduled meetings, something Gubu cites as “proof that they know they are guilty as charged”. Another resident Abongile Chama, 39, who has been living in the TRA for the last four years, said she and her neighbours deserved to be allocated a house from the new houses being built in Delft and the surrounding areas. “When we first came here the government told us we would be moved soon to RDP houses but it does not seem so now. We feel we are being neglected deliberately and it was a lie that we would be allocated RDP houses,” said Chama. Chama said she knows of people who have bought houses whom are connected to HDA officials. The area’s ward councillor Kayalethu Makeleni is on record saying that he also has proof that people have been sold houses by the HDA. Bruce Oom, spokesperson for provincial Human Settlement department MEC Bonginkosi Madikizela, said the department was aware of the protest and department officials had been deployed to the area to discuss the residents’ frustrations. He said after meeting with residents the department would be able to comment further. “We support people’s right to protest but disruption of property, we don’t support,” said Oom. HDA spokesperson Bosco Khoza said they take the allegations of corruption “very seriously” and will meet with the provincial government and the City of Cape Town this afternoon to discuss the matter further. Until then, they cannot comment.